The closure of a fourth former Local World weekly has been announced, 24 hours after new owner Trinity Mirror revealed a trio of newspapers were to shut. The company has confirmed the last edition of the Crawley News will be published next Wednesday, in a move which will also see the neighbouring East Grinstead Courier move to a Friday publication date. The News’s website will also close, although there will be no job losses as part of the changes. HTFP revealed yesterday that TM was closing Luton on Sunday, the Northants Herald & Post and Milton Keynes-based title OneMK, with up to 11 jobs at risk. All four are free newspapers, which were formerly owned by Local World and purchased as part of TM’s £220m takeover of the rival group last year. The last Wednesday edition of the Courier will be released on the same day as the News’s final edition, before the switch to Friday publication. A Trinity Mirror spokesperson said: “We continually review our print and digital portfolio to mitigate the ongoing challenges of print and advertising markets. “Our strategy across the group is to ensure we focus on markets where we are able to grow audience and revenue. 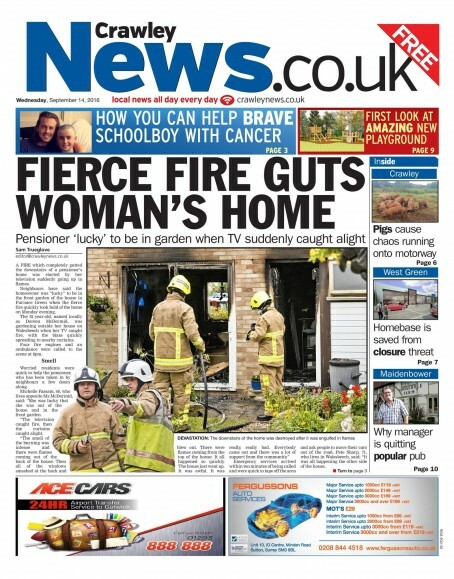 It’s for this reason we’ve been forced to close free weekly the Crawley News and its website crawleynews.co.uk. “The East Grinstead Courier will continue as a distinct title with its own masthead, and we remain committed to serving quality print and digital news to the local audience in this area. The loss has been lamented by former Croydon Advertiser editor Glenn Ebrey who edited the News between 2007 and 2010. He posted on Twitter today: “I understand that the Crawley News, a paper I spent four happy years on, is to be closed by Trinity Mirror. Such a shame. The slashing and closures go on unabated,however this sadly is the only way to curb spiralling costs on under performing papers so it’s understandable however unpalatable it may be for those affected. Too many ailing daily and weekly papers are limping along,unloved,unprofitable and having lost their readers, yet with crippling costs and high levels of, particularly commercial, staffing numbers which need urgent review, carrying on losing money throwing good money after bad makes no sense whatsoever. I see your point Johnnie, but the profitable papers have also seen their staff numbers slashed. Can you imagine if these companies were forced to pay for the overtime their staff work? You know, like decent firms. Then their costs would spiral and it would really hit home how badly their businesses have been managed. “The East Grinstead Courier will continue as a distinct title with its own masthead….” – for another few weeks anyway! I really hope I’m wrong but it’s really hard to stop a raging fire once you’ve set out on a policy of slash and burn.